Spring is a wonderful time of the year, isn’t it? I love the fresh seasonal ingredients that start to show up in the grocery stores and of course the farmers markets. I’m always looking to cook those up just as soon as possible and pair them with ingredients that are timeless. This recipe includes Lindsay Olives, pine nuts, parmesan cheese and cannelloni beans all of which you can pick up today no matter where you live. 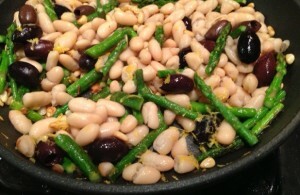 When making this dish you have a couple of options for the variety of Lindsay Olive you choose. I really like their Taste Profile chart which can help you make your choice. I would think Sicilian or Spanish Whole would be other good options besides the Greek Kalamata Olive. You can also either keep the egg on top or not. If you do make sure the yolk is soft and runny. This will help create a creamy sauce in your pasta. You can cook the egg in the oven like I did or in a skillet or poached in which you would add it at the end when serving. I would suggest 1 egg for every two people you are serving. This gluten free meal can be prepared in the time it takes to cook the pasta plus 10 minutes for the oven or most likely a total of 16 minutes. Not bad for a filling and tasty lunch or dinner. 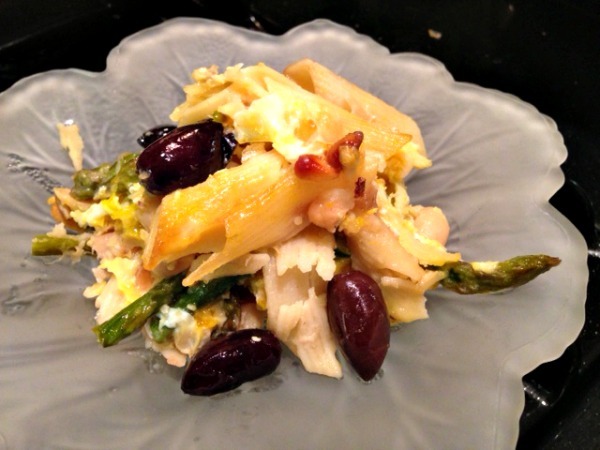 This recipe is part of a Kitchen Progressive Party event that will have five courses created by five different bloggers: amuse bouche, bread, salad, appetizer and entree, all posted today and all featuring Lindsay Olives. Now if you are a blogger you can submit a post featuring a Lindsay Olives recipe that you think would “complete” the menu or Progressive Party (cocktail? soup? dessert? sky’s the limit!). To help, you can go to the EventBrite page and request either product or coupons for Lindsay Olives. Once you’e created your dish (along with post/recipe/photo), submit a link to that post on the Kitchen PLAY . Your post needs to include links to both Kitchen PLAY and Lindsay Olives. Winner will be drawn from all the eligible entries received. The prize for the winner is $200. Good luck to all! Boil the water for pasta and cook according to package directions. When you start the pasta, heat the oven to 450° F and your large sized skillet on medium high. While the pasta is cooking, saute the asparagus and garlic in a teaspoon of oil with sea salt for just a few minutes. You don’t want the garlic to burn. Then turn down the skillet to the lowest setting and add in the pine nuts, lemon zest, olives and beans to start warming through. When the pasta is done, toss it into the large skillet and add in the remaining olive oil, lemon juice and the cheese then mix. Make sure the mixture is not dry. If so you can add in a little more oil. Pour this into a baking dish. You can top with a little more cheese if you like. If you are going to cook the egg in the oven crack them into a separate bowl and then gently let them slide out onto the top of the pasta. If you are cooking them in a pan just put the baking dish into the oven. Either way it should take between 8-10 minutes in the oven. Notes: You can add in Grilled Italian Sausage, Ham, Roasted Chicken or Grilled Shrimp to this dish. If the meats are warm mix them in before putting the baking dish into the oven. Or you could always serve on the side. If you would like to keep this vegan I would omit the eggs and choose another type of non-dairy cheese. My choice would be a little cashew cream cheese mixed in. This sounds delicious and I LOVE that flavor chart. What an awesome and educational feature. Thanks for sharing this. Much appreciated! Melissa I too love that chart. It really helped when creating the recipe as I knew the taste I wanted but wasn't totally sure which olive to use. Enjoy! OOOH, this is a keeper for sure! Can't wait to get some of their olives and start playing in my kitchen. Thanks for sharing, Diane. Excellent as usual! Thank you Ellen. You should jump in the party. Me too. It was fun tasting all of the recipes to come up with one. Love yours too! LOVE simply to pull together recipes like this one Diane! And I love me some good olives. Love the combo of flavors here – and I'm a fan of anything with eggs! Me too. I'm totally addicted to the local farmers eggs here. They are the best I've ever tasted. I would have never thought about putting eggs in there straight up. My mouth is WATERING Diane, and hello? This is freaking awesome because most people (including myself) think that you have to go completely without pasta in order to be gluten free. What a pleasant surprise!!!! Kimberly there really are very few things you can't either eat straight up or convert to gluten free. As long as you are eating real food, it's easy. Let me know if you give this a try. I do love my farm fresh eggs and put them on top of many things. Sharing more soon. I love everything about this dish! 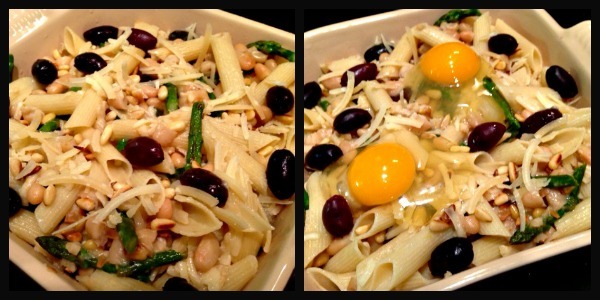 The fresh spring asparagus, the Kalamata Olives, the beans, and the runny yolk 'sauce'! Swoon. This looks just amazing! I love all your ingredients. I know my family would just love this. Pinning to make very soon.